Free Printable June 2021 Calendar. Print the blank June 2021 planner Calendar. Great printable for planning and organizing your summer vacations. 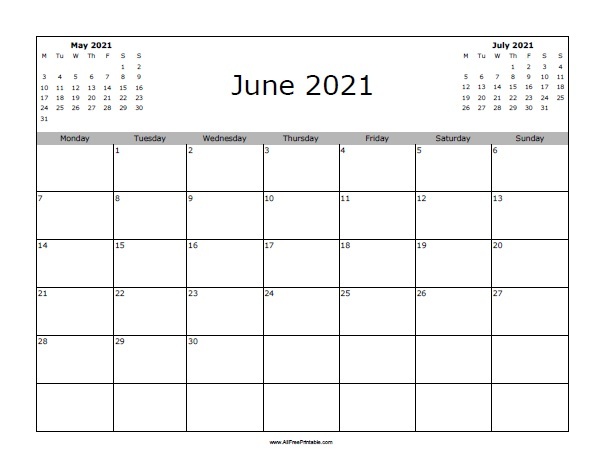 The June 2021 calendar includes previous month May and next month July. You can select from 2 options, calendar starting the week on day Monday or Sunday. Use our free printable June 2021 calendar to write important events of June 2021, like planning summer vacations, travel, summer camp, sport league, graduation day, summer school for kids, hotel reservations, sports, camping, cruise, beach, schedule, fishing, things to do at home and more. Click the link to print or download your free blank calendar free.